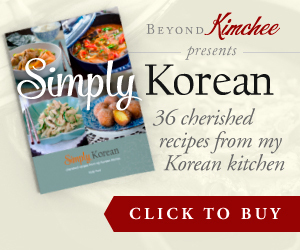 You are here: Home > Archives > Recipes > Korean Recipes > Main Dishes > Chili Bibim Sauce, doctor up! It will be Gochujang, the Korean chili paste. Koreans can’t live without this divine spicy paste, and I am one of them. 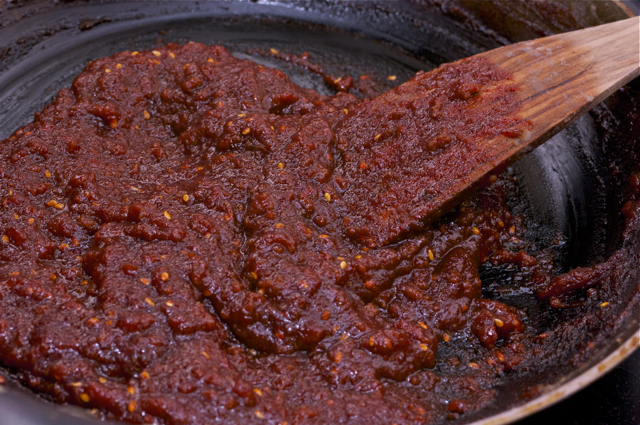 Gochujang is a father condiment of all spicy sauce in Korean cooking along with gochugaru (chili flakes). I am so happy to share with you a very special recipe today. 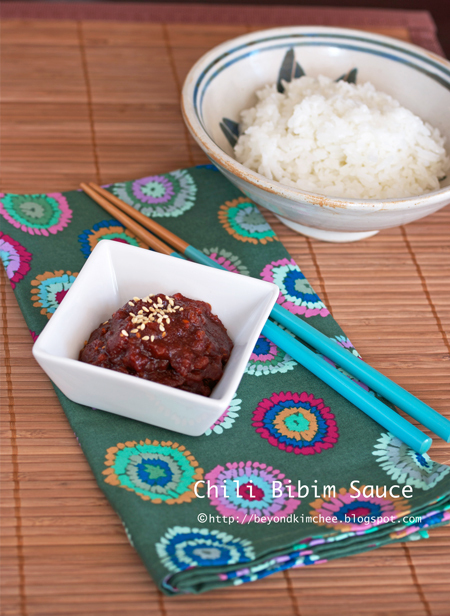 It is chili bibim sauce, doctored up gochujang sauce for dishes like Bibimbap. I like Bibimbap, the Korean rice bowl with loads of vegetables. I would pay extra money for a good Bibimbap if I have to. What makes good Bibimbap? The secret is in the sauce. It has a little bit of ground beef and honey in it. 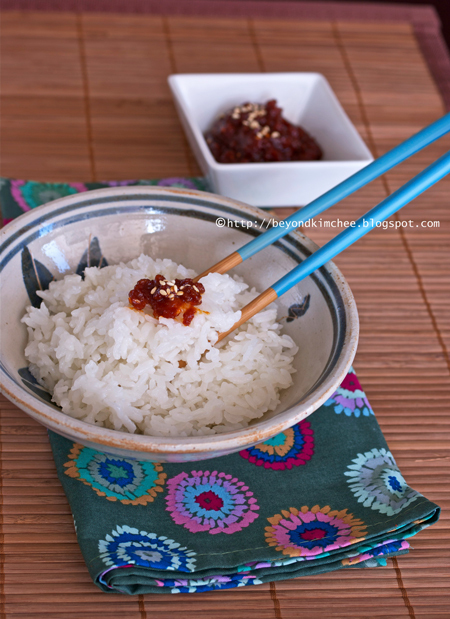 It is not only good sauce for Bibimbap, but excellent to top the plain rice. You can substitute the beef for mushroom instead if you are vegetarian. 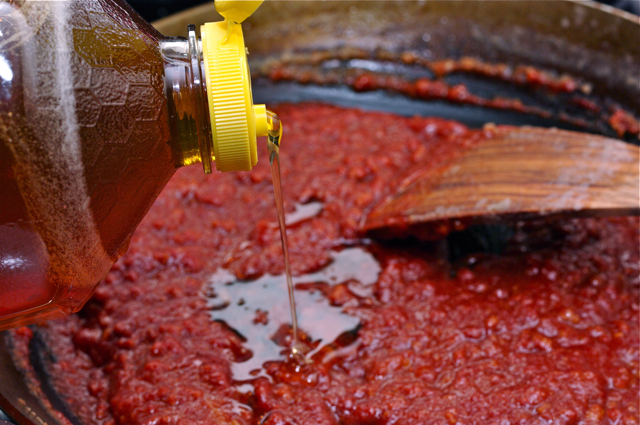 The beauty of this sauce is that you can store for quite a long time. I often use as topping on my rice and wrap with lettuce. Perfect for easy quick lunch! 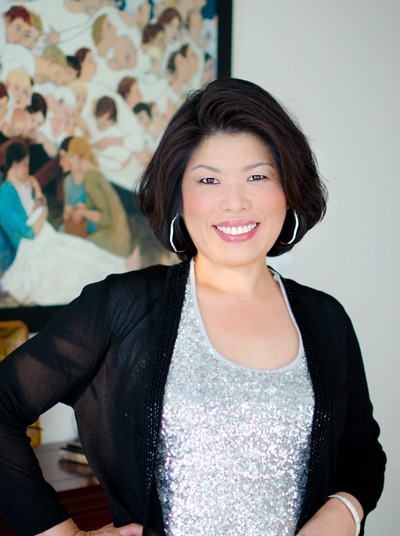 Let’s doctor up this Korean goddess. It is super easy ans you will LOVE it! 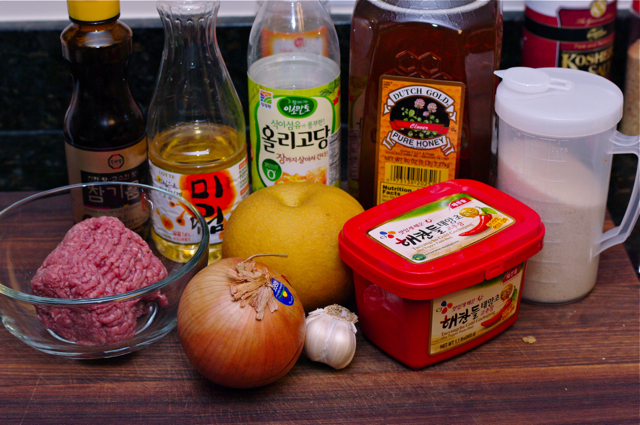 You will need; ground lean beef, Korean chili paste, honey, sesame oil, Asian pear, onion, garlic, sugar(optional), corn syrup(optional), rice wine or Mirim. Add sesame seeds in this group as well. Cut up onion and pear, put them in the blender with garlic, Puree their lives. 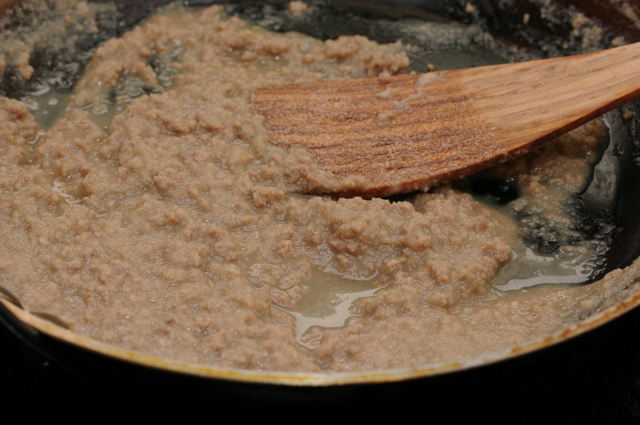 Pour the puree in the pan, add beef and 1Tbsp sugar (optional). Now, time to drop the bomb. The gochujang! Only 1/2 cup but add more if you dare. Mix! Add honey. The amount is up to you depends on how sweet you want your sauce to be. Don’t make it too sweet. Mix well and let the sauce thicken as you stir over medium low heat. They will thicken more as they rest in the fridge. Turn off the heat. Drizzle sesame oil and add sesame seeds. Add corn syrup for some shine. Wait until you taste it. You will lick your finger off. You’d better go cook up some rice. 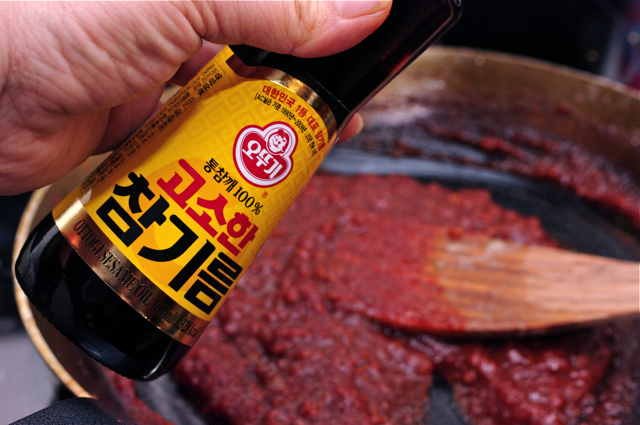 Mmmmm, who knew that gochujang can be this good? 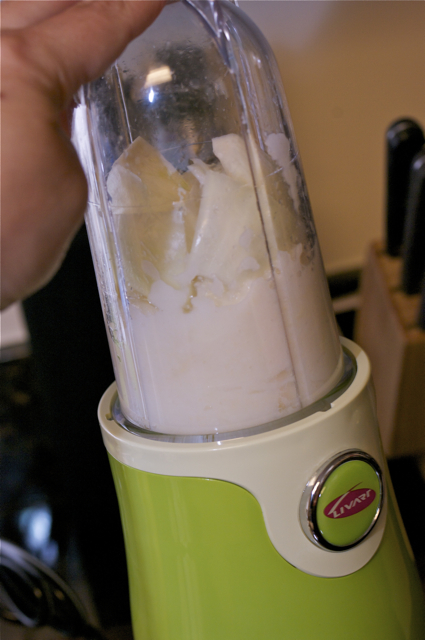 Put onion, pear, and garlic in a blender and puree until smooth. 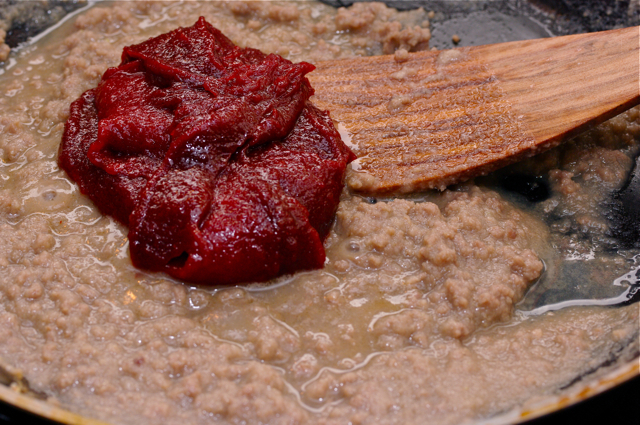 Pour the puree to the pan, add ground beef and sugar (if you wish). Cook over medium heat. 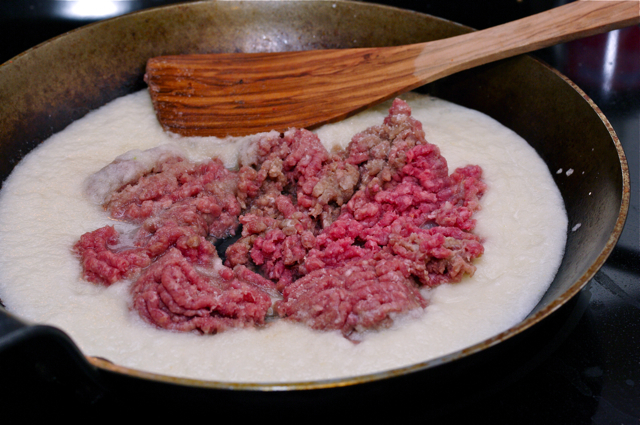 Smash the beef with spatula to remove any clumps as you cook. When the beef is cooked and the mixture is brownish in color, add gochujang and mix well. Add honey and thicken the sauce over medium low heat for 3-5 minutes. Don't thicken too much. The sauce will get thicken even more as it rest and stored in the fridge. Remove from heat, drizzle sesame oil, add sesame seeds and corn syrup for shine. Mix well until combined. Store in a airtight container in the fridge for a couple of month. Note: Serve as Bibimbap sauce or topping for plain rice. This is just one of the many Bibim sauce actually. Perhaps when you eat Bibimbap in the restaurant, it will come with different sauce without beef in it. But this version is so good with vegetable bibimbap. that sounds like an awesome sauce to have at hand!! (: love your blog! Hi! If we substitute the beef with mushroom, what type of mushroom should we use?! Would like to make both versions :) OMG I'm salivating looking at the pictures! Use shitaki mushroom either dry or fresh. If using dry, soak them in water for at least 1 hour to rehydrate. Holly, Sorry to hear about your accident. Hope you recover soon. How long can you keep this sauce in the refrigerator? Can you freeze it? You can keep the sauce for about 3 weeks in the refrigerator. I wouldn't freeze it.